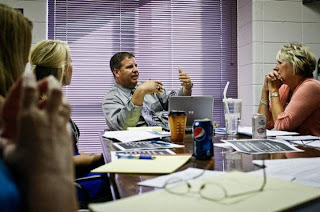 Fostering collaboration among groups of people (committee format) is a research-proven step toward effectively attaining school or district goals, but leaders sometimes neglect a very vital part of the process- "pressing the flesh" with individuals or smaller groups to air concerns and iron out disagreements before they fester. In grassroots fashion, school leaders should spend ample time setting up the big-group discussion by working the halls and classrooms to generate conversations about the goal. It is easy for an educational leader's impatience to sabotage his/her goals by skipping the all-important one-to-one chats that give stakeholders a chance to be heard and an opportunity for them to feel they feel ownership of the goal-attainment process. The Harvard Business Review (February 7, 2011) reminded us that since employees are ultimately responsible for reaching [company] goals, they need to have a strong voice in [attaining] them. Recently, I had to break an impasse between two factions of teachers within a committee that was tasked to craft the mission for a special program. Both groups were passionate about the program but had serious differences in opinion about the direction in which it should go. I stepped in to break the impasse and made a hard decision that upset one of the two parties. Two days after my decision was announced, I worked the halls and the classrooms, reaching out to the disenchanted teachers. My purpose in speaking with each of them was not to persuade them that my decision was a good decision, but rather, to let them vent their frustrations. Before leaving each meeting, I told the teacher that while I respected his opinion (I would not have asked the teacher to serve on a committee if I didn't value his input), I expected him to rally around the direction for the sake of the kids. Educational leaders will have to make bold decisions from time to time. Speaking with people individually or in small groups will alleviate the tension and re-engage everyone involved in solving a problem or working on a project so the ultimate goal can be attained efficiently and effectively.